Will pot be regulated in Kern come November? It's something the Board of Supervisors made clear: they don't want the marijuana business in Kern County. The 4-1 NO vote in October 2017 sent a clear message: it will be up to the voters to decide. This past July County Supervisors voted to allow two measures on the November ballot, one that deals with only regulating medical marijuana sales, the other regulating commercial adult use and medical marijuana. 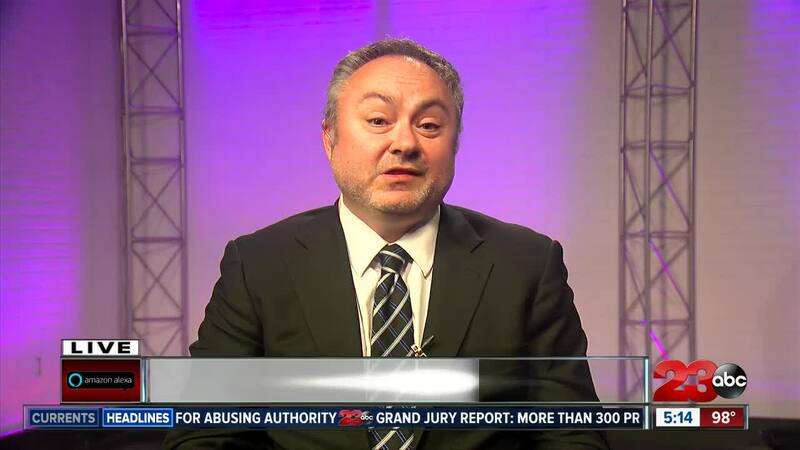 "I think we have a very good shot the measure will get passed," Eilenberg told 23ABC's Tim Calahan during a live interview Tuesday. "The voters have been very vocal about the fact that they want regulation and taxation in Kern," Eilenberg said. He says it only makes sense that Kern County gets into the marijuana industry given it's significance in the agricultural industry. The measure Eilenberg is supporting calls for two zones to be set up in areas off Interstate five--one near Copus road, the other near the highway 58 interchange--the only areas that manufacturing, cultivation, and distribution would be allowed under the measure. It would also cap the number of retail dispensaries to 35. Both ballot measures would require any operations to have a state licenses. Eilenberg says the measure benefits Kern County because it provides a way for fees and taxes to be collected on all cannabis activities, including a 5 percent tax on gross retail revenue. Eilenberg denied allegations that he stands to gain financially if the measure is passed. In July, David Abasi, representing the Central Valley Cannabis Association told the Ridgecrest Daily Independent newspaper, about the measure Eilenberg is supporting a "special interest self-serving monopoly of sorts" because he alleges property had been purchased in advance of the measure being proposed. "I'm a lawyer, my salary remains the same whether it passes or not," Eilenberg said of the allegations. "No I don't have anything to gain one way or another." He said he and his supporters have done their homework. Speaking with religious leaders, veterans groups and community leaders to craft what he calls the best, and closest version to what the County was planning to vote on in 2017. "Our measure is about 98 percent what was already put forward by the County Planning Director." "We built off the backbone of what has already been done," Eilenberg said. Voters will decide which measure they support when they vote November 4th. "This actually avoids all of the controversy that has occurred in the past and allows the voters to simply decide the fate for Kern County."